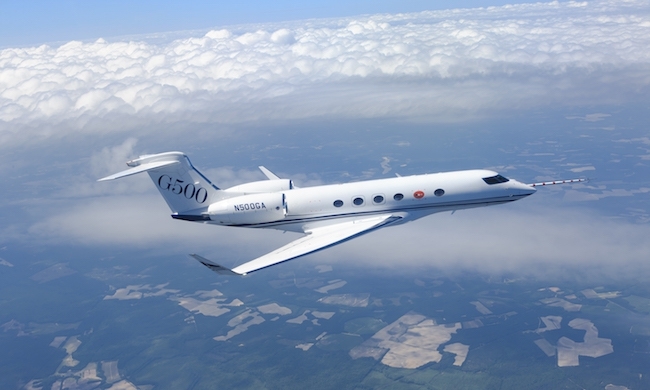 Gulfstream Aerospace Corp. has announced that the Gulfstream G500 has completed five test flights since it first took to the skies on May 18. During more than 15 hours of flying, the aircraft achieved a top speed of Mach 0.80 and a maximum altitude of 38,500 feet/11,735 meters. The aircraft’s longest flight was more than four hours. Over the past several weeks, the aircraft has been undergoing planned modifications in preparation for returning to flight later this month. Gulfstream announced the G500 and G600 family of aircraft on Oct. 14, 2014. Programs for both aircraft are progressing well. As the first G500 flight-test article undergoes modification, two more are preparing for flight and a fourth is in production. Additionally, the first G600 flight-test aircraft has begun the initial stages of production. Together, the two programs have completed more than 36,000 hours of lab testing, and both the G600 integration test facility (ITF) and the G600 Iron Bird are now operational. The engines for the G500 and G600, the PW814GA and the PW815GA, respectively, were certified by Transport Canada in February. The G500 and G600 also include Gulfstream’s all-new SymmetryTM Flight Deck, the most advanced, stylish, comfortable and intuitive flight deck in business aviation. The cutting-edge technology comes in the form of active control sidesticks (ACSs), integrated touchscreen controllers, next-generation enhanced vision system (EVS III), and Honeywell Primus Epic avionics. The G500 and G600 cabins maximize comfort, with an industry-leading cabin altitude of 4,850 feet/1,578 meters at FL510 and 100 percent fresh air that boosts mental alertness and productivity while reducing fatigue.